In my perfect, fanciful world, Virginia Woolf is my muse. In my real one, all she has ever done is lead me to abandon punctuation & paragraphs while I, in the mistaken belief that I understand ‘stream of consciousness’ well enough to make it a viable motif in my own writing, follow like a witless fool. I freely confess to having wasted a lot of valuable time in this pointless pursuit. My actual muse is a creature who lives somewhere in my bathroom. (She is probably a Daddy Long Legs or a small spider. Or even a helpful cobweb.) I know this because, without fail, each time I run a bath with the specific aim of mulling over a particularly puzzling writing-related issue, once I lie down in the water, I invariable mull usefully. For the past two days I’ve been outlining Book Three. The idea has been hanging round for some time & all at once, I got it. Apart that is for a small but crucial plot strand. It is the lot of a first draft to be the dumping ground for sundry swathes of ‘darling’ destined for the verbal killing fields. As I draw to the end of this new draft zero I ponder what comes next. Run off a hard copy, read it through in as few sittings as possible in order to get an idea of how it works as a story. Next I’ll arm myself with a bunch of sharp pencils, a note pad, a highlighter pen and a willingness to laugh wryly at myself, and begin the second pass. This is when I start giving myself advice and hopefully identify any massive plot holes and structural issues. By the time I get to the fine-tuning however, something more will be required. Ironic perhaps to choose a Virginia Woolf quotation: she was after all partial to a bit of wordage. She also had an acute eye for the lyrical and she understood style. The individual writer chooses her style. Our voice tends to choose us; style is something else and can be considered. We can edit our style as we edit our narrative arcs, poke around in our plots and ravage our purple prose. Before I received the offer for Ghostbird I was happily writing my new story because I wanted to. It has been quietly gathering momentum for almost a year. I was under no duress and there were no expectations. Now it’s real – I’m going to be published – and inevitably there will be a certain expectation of a second book. It’s daunting but then again, it’s only me and no one is waiting with actual bated breath for my follow-up are they? If people read your first book and like it, they’re almost certainly going to want to read your second one. And judge it. I know I have to be careful and not mess it up. I never saw myself as a ‘successful author.’ (Those of us who suffer from arrested development don’t.) Frankly, I read far too many brilliant books to kid myself. My literary sheroes include Edna O’Brien, Susan Hill & Maggie O’Farrell. Most of the time I read exhilarating literary fiction that makes my heart sing. I read writers who, if you cut them open, they would bleed words. Fame is not the goal. Acceptance is. That’s what being published means to me & what keeps me writing. 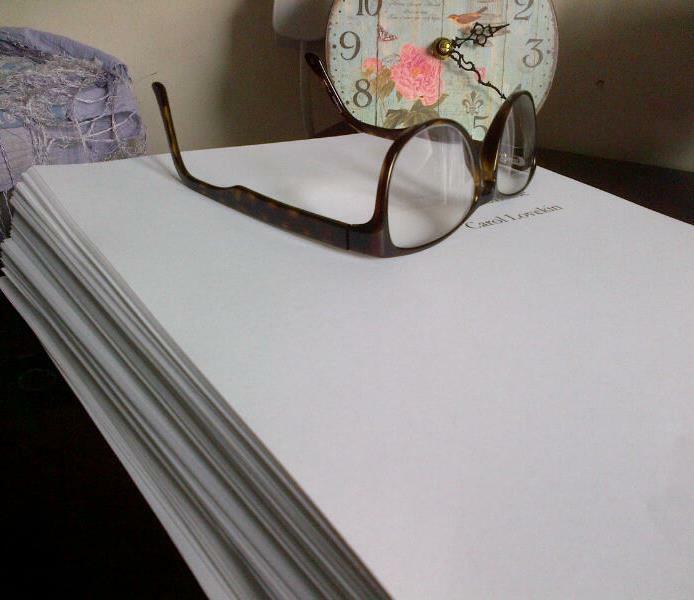 All at once there is less time to devote to the second novel. I’m learning fast that there is more to being published than simply writing a book & securing an offer for it. Behind the scenes lies an entirely different process: one I must be open to & respectful of. I don’t want to become a bully either: hassling myself to get the second book finished. If I don’t enjoy it, what’s the point? I do have a head start. The first draft is almost done but what if I become complacent or insecurity convinces me it’s rubbish? What if I take a wrong turn or the premise of the story begins to look less appealing? When I began it, I thought this second book was a far cry from Ghostbird. It has an utterly different kind of main protagonist and yet even so, as it takes shape I find myself wondering if maybe, after all, I am saying the same things. There are clear similarities – I’m writing in a related vein & exploring comparable themes. The landscape possesses an echo of Ghostbird. Have I managed to find new and different ways to lay these familiar motifs before my readers? It matters. I don’t want to be a one-trick turn. Within my new story I seek a different voice. Not my writing voice – that’s pretty much set now. It’s her voice I still wrestle with, the voice of my central character. She is a different generation from the main character in Ghostbird and although I have a good deal more in common with her, I still have to find that elusive something that sets her apart and will make people care about her. Cracking on then… see where I go & when I get to the end, where I’ve landed.